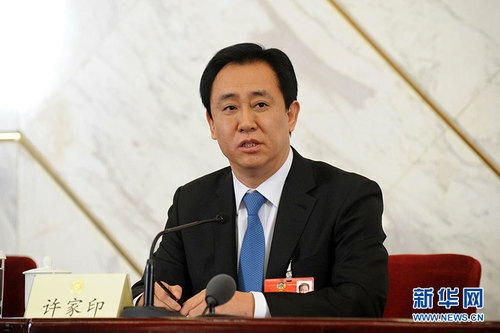 With personal wealth of $36.7 billion, Hui Ka Yan, chairman of real estate developer Guangzhou Evergrande Group, has become the richest man in China. Hui's fortune puts him ahead of Alibaba chairman Jack Ma ($35.4 billion) and Tencent founder Pony Ma Huateng ($35.3 billion), according to the Forbes Real-Time Billionaires List. China's three richest men currently rank respectively 20th, 21st and 22nd in global ranking. It's attributed to changes in share price, China Securities Journal reported. Shares of Evergrande continued to rise over the past month. Based on strong performance, Southwest Securities predicted the compound growth rate of the net profit attributable to parent company will be 48.1 percent in 2018-2020. Meanwhile, the valuation of Evergrande will jump by 8 times in 2018, with price target of HK$33.42, Southwest Securities added and maintained its "buy" rating on the company. On the other hand, shares of Alibaba and Tencent tumbled, dragged down by global tech stocks. On Friday, the Dow Jones Industrial Average fell 558.72 points, or 2.24 percent, to 24,388.95. The S&P 500 lost 62.87 points, or 2.33 percent, to 2,633.08. The Nasdaq Composite Index dropped 219.01 points, or 3.05 percent, to 6,969.25. Shares of large-cap tech companies declined on Friday, putting pressure on the benchmark indices. Netflix and Amazon traded 6.27 percent and 4.12 percent lower respectively. Shares of Apple and Alphabet both fell over 3 percent. As nearly half of the wealth in the Billionaires List come from technology companies, the tumble of tech shares could reshuffle the rankings. Some insiders said that at present, the overall valuation of US stocks is relatively high, and market volatility will be normal in the future.